We just picked up the latest edition of Flea Market Style magazine. All we can say is LOVE!!! If you don’t have a copy run out and get one! We picked ours up at our local Wal-Mart. Flip to page 29 and you’ll see an incredible storage bench made from a paneled wood door. They’ve added salvaged back plates and door knobs to one end, providing a great place to hang totes, scarves, handbags, etc. Guess who has tons of salvaged paneled doors, back plates and knobs… WE DO!!! Just last week we posted a fabulous antique wooden ladder to our New Arrivals page. The latest edition of this magazine gives us 8 pages of terrific ideas on what to do with old ladders! Yes, 8 full pages, beginning on page 58! They have turned old wooden ladders into a headboard for a bed, tables, shelving, a display rack, and more. We can’t say enough about how much we adore this magazine. We are still pouring through it’s pages. We often have customers who will see an item in our store that they absolutely love but they don’t quite know what to do with it. This publication has given us some wonderful ideas on how to re purpose salvaged items like some of what we have available in our store. Better yet… they even give us step-by-step directions for a few of their featured projects, including the storage bench. Keep an eye on our blog as we have our own project that we are working on! As soon as it is complete we will be posting pictures as well as directions here! What is it about doors? We wait at the door, have closed door meetings, open door policies, next door neighbors and continually look for those doors of opportunity. Doors represent a point of transition that take us from one environment to another. We have noticed a growing fascination with old doors. They represent a piece of history. It’s not just the piece of wood that marks the entrance to a building but the passage of those who have entered the building that fascinates our imagination. If you read last week’s newsletter or blog you already know that we just returned from Pennsylvania with a trailer load of salvaged items, including over 35 doors! We are in the process of adding the doors to our website. Each door will be listed with an ‘as is’ price as well as a ‘restored’ price. All of the doors have been taken to our restoration shop where one-by-one they will be cleaned or stripped and sanded. Once they have undergone a makeover they will be listed at the restored price only. We’re seeing a growing trend… doors used for all types of crafting projects. Currently, our most popular doors are the chippy painted, shabby chic style doors of which we have a large, varied selection! Visit our Pinterest page and you’ll see some of the fabulous things being created with old doors. Doors turned into headboards, shelves, porch swings, wall paneling, cupboards, chalkboards, tables and more. We’ve posted so many ideas to get your creative juices flowing! Southern Accents houses the best selection of salvaged doors in the South East. We have well over 3,000 salvage doors ranging in price from $30 to $17,000. Our selection includes a wide variety of wood species, styles, and colors for interior as well as exterior use. We have tackled residential projects where each door in the house was different and unique. We’ve also worked on large commercial projects, custom building doors from salvage wood so that each door was uniform in design. Whether your door project is large or small… we can help! Many of you are probably familiar with the television show American Pickers on the History Channel. Garlan Gudger, Sr. was ahead of his time when he began picking in 1969! Garlan Jr. has been doing a little picking of his own lately. Although our business centers primarily on salvaging architectural antiques, we do enjoy rummaging through old junk and walking away with some really cool finds. Our New Arrivals page currently displays items that Garlan and Amy picked up during a recent trip to Georgia. Hearing of an old salvage store that was going out of business, they quickly headed east to check out the treasures. Last week found Garlan and Shane in Philly, Baltimore and Washington D.C. They brought back antique doors, iron gates, trim and more! We anxiously awaited on this sneak peek of some of their fantastic finds (pictured)! Their haul made it back to Cullman and the items have been unloaded and pictured. A few have already been posted online with many more to come. Some items need a few repairs while others have gone directly to our restoration shop where they will be fully restored. These items will make their appearance online once they’ve had their makeover! As much as we love ‘picking’, we also love seeing the incredibly creative things our customers do with our finds. We purchase pieces that we think have the potential of being given a new life, re-purposed into a useful item or beautiful work of art. We see the possibilities but it is our customers who constantly amaze us with your creativity. We can’t wait to see what you do with our picks and love getting your ‘after’ pictures! Watch the New Arrivals page where our latest discoveries will make their debut! In the mean time, visit the Our Story page and read all about how Dr. Gudger turned his love of rescuing and restoring architectural salvage into what has grown to be one of the largest stores in the nation. Have you seen our selection of hardware? We have an extensive collection of antique door, window and furniture hardware. Visit our showroom and you’ll quickly see that we have one of the finest collections of antique door knobs an d matching sets. Our upstairs showroom displays hundreds of antique hinges and backplates as well as pulls, door knockers and more. Sample boards of the vast selecti on of new and reproduction hardware that we can special order can also be viewed upstairs. The combination of our antique collection along with the special order hardware that we have access to gives us the ability to outfit your entire home, office or building project. We work with individual as well as contract jobs. Give us a call at 877 737-0554 and let us assist you with your next project! We are in the process of including many of our smaller items and hardware on our website adding the ability to order these items online. Most of these items will be listed on the Hardware page or the Other Items page. Any items shown with an “Add to Cart” button can be ordered online and shipped via USPS. Many of our customers call searching for a knob or pull to add to a single door or piece of furniture. With the popularity of sites like Pinterestwe get many requests for items needed for crafting or DIY projects. We are working to make it more convenient for our customers to find and order the perfect finishing touch to whatever project you are working on. We have already added quite a few antique door knockers to the hardware page. We will continue building the hardware category adding to it on a weekly basis. Speaking of hardware, Garlan Gudger, Sr. starting collecting antique door knobs in the late 1960’s. We have the finest and most unique collection on the East Coast displayed in our showroom! We invite you to stop by and view this one-of-a-kind collection. Seeing the picture of this 1920’s barn brings back a lot of fond childhood memories of time spent in my grandparents barn. It has been a lifetime ago but I can still remember climbing the stairs to the hay-filled loft and swinging on the stall gates. As a child, I saw my grandparents’ barn as a big maze. There were doors and openings that I perceived as secret passages. I would spend hours playing hide and seek with the cousins. My first kiss, an innocent peck on the cheek from a childhood friend, was embarrassingly received in a barn loft. As many precious memories as I have of time spent on the farm, sadly my own children missed out as my grandparents have since passed and the old barn has been torn down. 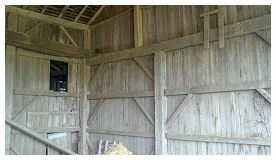 We’ve seen a great deal of interest lately in salvaged barn wood. We don’t think the interest is fueled as much by the “green movement” as it is by our desire to salvage fond memories of simpler times. We just brought back 126 pieces of red and white oak taken from this Hudson, Indiana barn which was recently disassembled. The planks are in great condition and can be cut in widths for use as a wall or ceiling covering. We used salvaged barn wood on the walls and ceiling in part of The Green House that we recently renovated (pictured right). The barn wood is a small sample of our salvaged wood collection. Our wood storage facility formerly served as the Wallace State basketball gym. We’ve raised the goals and the old score boards are still hanging on the walls. Where fans once cheered and players raced down the court, pallets of usable wood salvaged from old barns and buildings sit waiting to be turned into beautiful flooring, furniture or works of art. 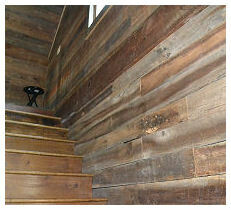 We have created a pin board on our Pinterest page showcasing re-purposed barn wood. It is filled with creative ways this salvaged wood has been used to create stunning furniture, flooring, frames and other useful items. We invite you to browse our board as well as send us pictures of how you have preserved history or perhaps fond memories by giving new life to old wood.